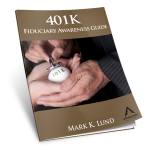 Just by reading The 401k Fiduciary Awareness Guide, you will know more than most plan sponsors about what it means to be a prudent fiduciary. In addition, you will have the necessary tools to protect yourself. The first thing we are going to cover is the Seven Deadly Fiduciary Traps and how many plan sponsors (just like you) unsuspectingly fall into them. Plus, you will receive some specific Success Strategies that can help you smash the Traps forever! These Traps cover 401(k) plans, profit sharing plans, and various types of charitable trusts, etc. This guide is only for the strong of heart who can bear the weight of the truth. Let’s face it…the truth can hurt. If you are a trustee, plan sponsor, or even an investment committee member, the simple truth is that you are a FIDUCIARY. What does that mean?